Thousands of school kids all over the world stand up for their future by missing school in protest to government climate change inaction! 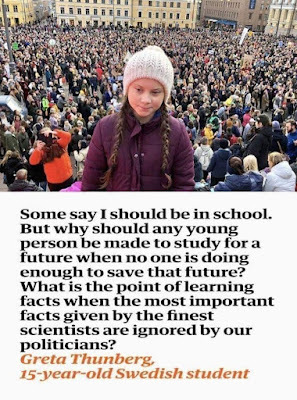 The seed was planted when inspirational Swedish school pupil, Greta Thunberg, decided she'd had enough! She woke up one Friday, last year, and instead of attending her school, she went and stood outside the Swedish parliament in protest at the government's lack of action on climate change. She knew her future and the future of her peers was at risk, so why weren't those in power doing anything about it? Every Friday since then, Greta continued her strike and in doing so she has managed to kickstart a global movement. On Friday 15th February, thousands of UK students from primary age upwards followed suit by dropping their pens and pencils for a day and picking up a placard! As part of the movement Youth Justice 4 Climate, these school kids felt that their voice wasn't being heard and the government was not doing enough to make their future seem secure. The attitude of those involved was, what use is it learning facts when the future is in jeopardy? 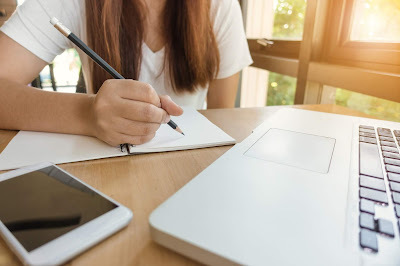 As well as calling for immediate and critical action to be taken regarding climate change, students also made it clear the government should lower the voting age to sixteen. Support came from all ages, with kids as young as three or four in attendance all the way up to proud grandparents, cheering their grandkids on. 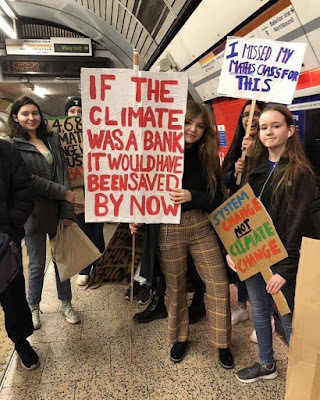 True enough, however, there has been a mixed response to the strike action; many schools have condemned the strikes and have told children NOT to attend while the UK Prime Minister, Theresa May, stated that these school children are "wasting lesson time" and the Education Secretary Damian Hinds said "missing class won't do a thing to help the environment." But the protestors are determined and not about to give up! Another strike is set to take place in the UK on the 15th March. Will you be joining them? I have so much respect and hope for today's young people, and the strike against Climate Change is really inspiring at a time when world politics looks quite grim. What do YOU think about the young strikers? COMMENT BELOW to have your say! We asked readers to tell us about their favourite romantic scene from a CC book... this is the result! My favourite love scenes from a CC book will always be the scenes in CHERRY CRUSH when Shay goes to visit Cherry on the steps of the gypsy caravan. Especially the first time, when he just happens to be wearing a werewolf mask! Don't ask me why but it's just so lovely, and Shay is my favourite CC boy character of all time. 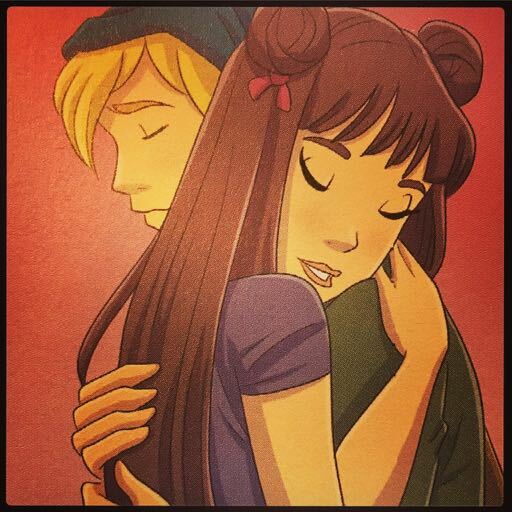 My favourite couple in a CC book has to be Jude and Carter from SUNDAE GIRL. Carter is so cute and so funny, and very believable. I like the bit where they are walking home in the snow and Jude thinks he is going to kiss her, and instead he shoves a snowball down the back of her neck! It made me laugh out loud because it is just the sort of thing the boys I know might do. I also like the romance in LUCKY STAR where Cat and Mouse have a picnic sitting on top of a bus shelter! I like that the romantic bits are funny and not too mushy, and the boys are always cool. 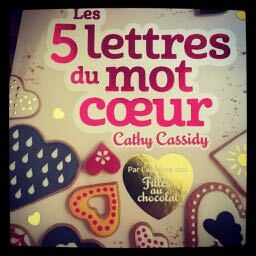 My preferred book from Cathy Cassidy is LES CINQ LETTRES DU MOT COEUR for I prefer a book that is sad and the characters I liked very much. I like the scene of the paper cranes, and how you see that the boy is much gentler than you think, when everyone thinks he is very bad, but really in fact misunderstood and very kind. It is a book of friendship more than love, which I like very much. The book is perfect for me. LIFE IS SWEET is my favourite CC book as it shows so many behind the scenes glimpses of my favourite characters and an insight to how they think. My best characters are Summer and Skye who have a birthday on St Valentine's Day but are such very different characters even though they are identical twins. Summer is very girly and Skye not so much. I like the story where Alfie is trying to organise a Valentine's Day treat for Summer because it is so sweet and actually made me cry a bit the first time I read it. For Christmas a couple of years ago my mum got me a copy of LOVE, PEACE AND CHOCOLATE from eBay, a quite rare CC book from a few years ago. Quickly it became my favourite of all the books, even though it is short. It is a book about two best friends who fall for the same boy, and how their friendship is shaken by that. It is also a book about why a boy should never be allowed to come between two best friends! It is the opposite of a 'romance' in many ways, it is a book about girl power and friendship and not being taken in by losers. (I am nineteen now so maybe I can just see the message more clearly now!) 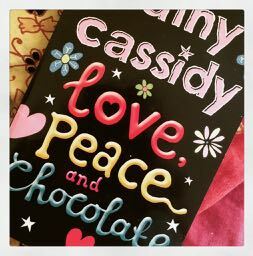 Also it has the best title ever, because what more could anyone want but love, peace and chocolate? Aww I love these comments! 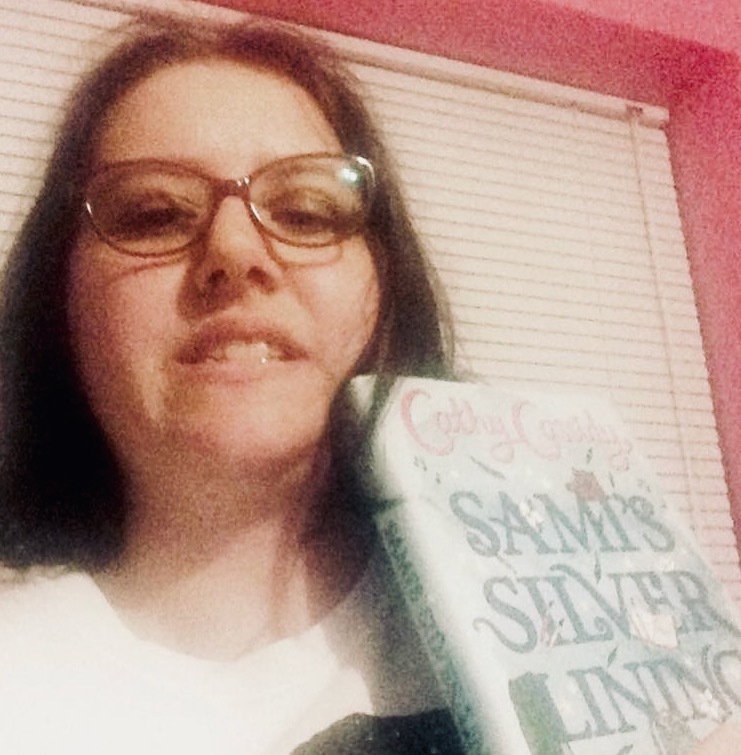 Do YOU have a fave CC book? If so, which one - and why? COMMENT BELOW to have your say! I've been a big fan of CC books since we read INDIGO BLUE at primary school and I remember emailing Cathy once to tell her I loved it; I was so excited when she replied! I'm an adult now, but still love CC books. I've just finished reading SAMI'S SILVER LINING for the fourth time and I think it's one of my favourite books. As a vintage fashion and music lover, I adore all the references to The Kinks, The Small Faces, The Beatles and more - the character of Louisa Winter sounds like she could be a future me, to be honest! 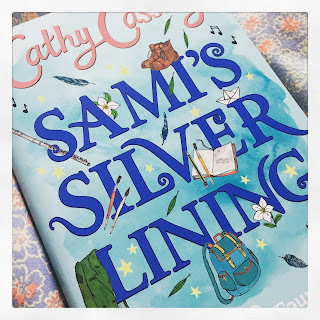 The more serious undertones of the story in SAMI'S SILVER LINING focuses on the plight of child refugees and the war in Syria, and this got me thinking about how I could help. Like Sami, I like music and doodling, and I already sell my artwork on a website called RedBubble. So I decided to make some music-themed Valentine's day cards and to donate the money from these sales to the refugee charity Safe Passage, mentioned at the back of the book, who help child refugees find safety. So far I've got Marc Bolan, Morrissey and Beatles themed cards, and I'm hoping to add more designs. I'm also sharing my artwork on my Facebook and my Instagram asking people to buy prints or donate to the charity, so I thought I'd let you know how I'm helping! My art designs are on my RedBubble page, HERE and my Instagram is @theblondeberet... please do follow and if you can buy a card or donate, that would be amazing! 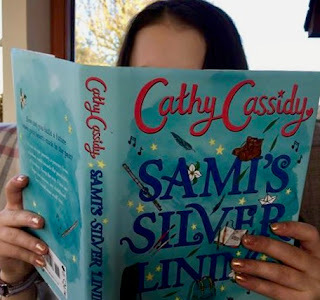 Thank you Cathy Cassidy for writing such an amazing story and inspiring people to think about and help out with the refugee crisis. I'm looking forward to reading the next chapter of the Lost and Found! Nallie's response to SAMI'S SILVER LINING just blew me away... I love that she's been inspired to raise money for SAFE PASSAGE and I also love her gorgeous retro music-themed cards and artwork! Can YOU help by donating or buying one of Nallie's cards? Click the link above to find out how... and make Valentine's Day a day of spreading the love for everyone! 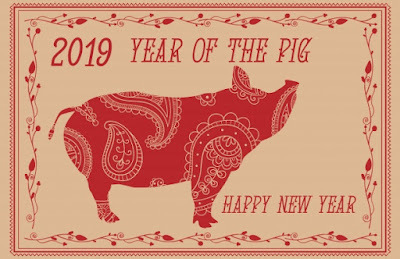 The pig is the last in the twelve year zodiac cycle in the Chinese calendar. When the Jade Emperor called for a great meeting, eleven animals came racing along including a monkey, a rooster, a dog (to name but a few) and just as the emperor was about to call it a day, an oink and a squeal was heard and along came trotting the pig! 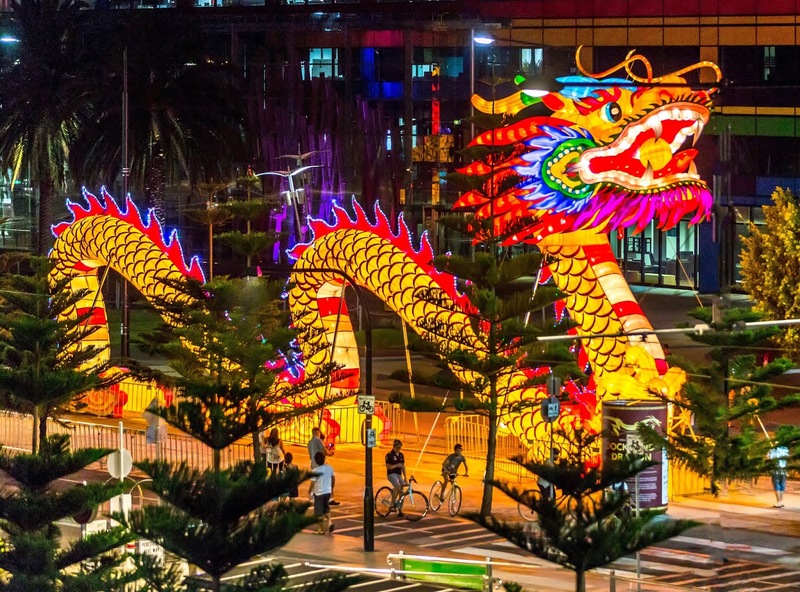 Here are ten cool things you may not know about Chinese New Year!! 1) In the distant past, there was a legendary great beast named Nian that would come every New Year’s Eve. The people lived in fear of this beast that had the head of a lion and the body of a bull. Eventually, it was found out that Nian was afraid of three things: the colour red, loud noises and fire! With that in mind, villagers started to decorate their houses in reds and scarlets, set fires in front of their doors, and stayed up all night making loud festivities and celebration. When Nian next came to visit, it scuttled back into the mountains in fear. Everyone celebrated, and though Nian never returned, the traditions persist just in case!! 2) More fireworks are set off that night than any other night of the year! Firecrackers are supposed to scare off monsters and bad luck for the coming year, so people stay up on New Year’s Eve and set off firecrackers at the strike of midnight. In the morning, firecrackers are used again to welcome the new year and good luck. 4) Your 'benming' year is the year of your zodiac animal. And of the 12 year cycle, it is the unluckiest for you. There are several reasons for this... the Chinese believe that children can easily be taken by demons. And your 'benming' year is your rebirth year. 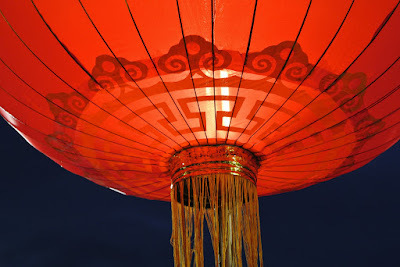 5) Chinese New Year ends with a lantern festival. This festival dates back thousands of years to when Buddhists during the Han Dynasty hung lanterns in their temples. It usually occurs on the very last day of the festivities and on the New Moon. Signifying the coming of spring and family reunion. 6) Red envelopes - containing money is an old tradition. The colour symbolises energy and fortune. Many carry several in their bags just in case they run into someone they wish to gift it to. It is frowned upon to open them in public and it is polite to receive them with both hands. 7) Black AND white clothes are considered a bad omen. Both these colours are a symbol of death in Chinese culture and therefore should be avoided. The best colour to wear is red, as it is a symbol of good luck. 8) Cherries are one of the most popular foods in this festive period! Its red colour obviously ties in with the prosperity and fortune theme; and its roundness symbolises perfection and eternity. Watch supermarkets stock up!! 9) 'Nianhua' or New Year pictures, are traditionally hung on doors during the festive period. The practice is particularly popular in the countryside and was recorded as far back as 800 years ago. The images are brightly coloured scenes of prosperity and good luck. Symbols such as birds and different fruits are popular, with one of the most common scenes being a plump baby with a really big fish!! 10) Everyone has a birthday on the seventh day! That's right, happy birthday to us all!! It is the celebration of Renri, the birthday of all humans. According to tradition, the goddess Nuwa created human beings from clay on the seventh day... so we all get to celebrate! Well I've learned something new!! Have YOU got any cool stories or traditions you'd like to share? COMMENT BELOW!